THE ENTERPRISE OF custom builders is an ever-changing landscape. 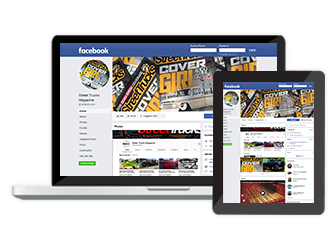 The automotive industry and its aftermarket are constantly growing and developing. With the rise of new trends and preservation of old ones, young blood and talent will always have a place in the resurgence and growth needed for an industry to span generations. Such was the case for Kirby Cooke and his custom automotive business, ’89 Speed Shop. 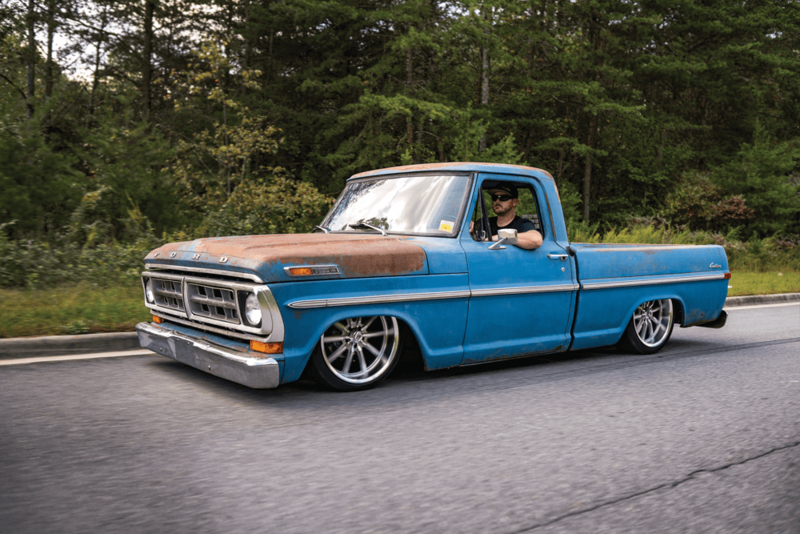 The North Carolina native was born into a “family of gearheads,” and that passion definitely passed on to Kirby at a young age. 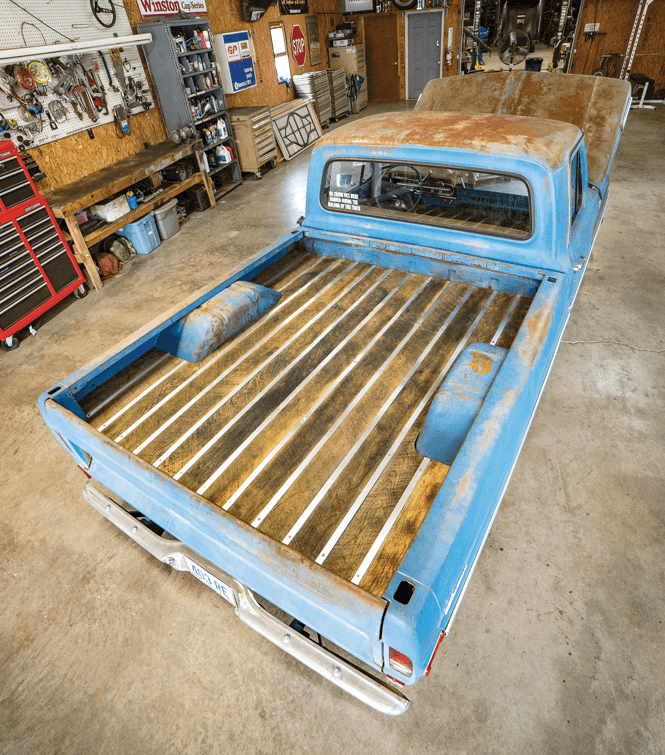 Kirby built his first classic truck as nothing more than a hobby project. The reaction in his community, however, led him to think that he might be onto something. 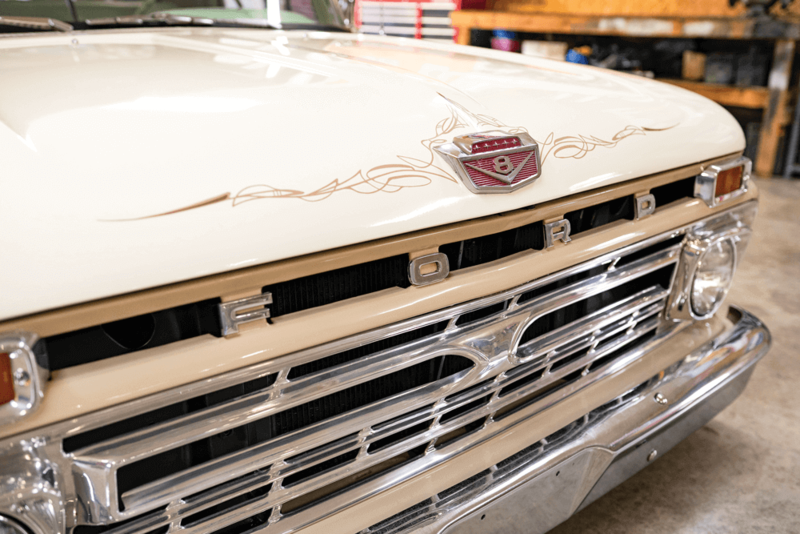 With the ever-growing demand for custom classic trucks, Kirby launched his own custom shop right in his hometown. ’89 Speed Shop is a collection of preserved tradition with fresh enthusiasm. It’s a mixture of young talent and old souls. 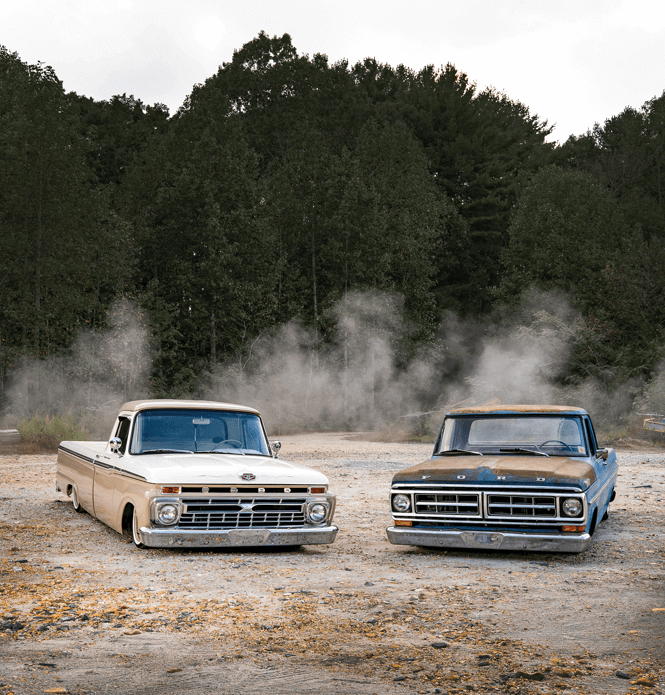 There may be no better way to describe the two F-100’s built by Kirby and his team. Both trucks are old souls with fresh life breathed into them by a combination of custom mods, timeless styling and pure badass parts. 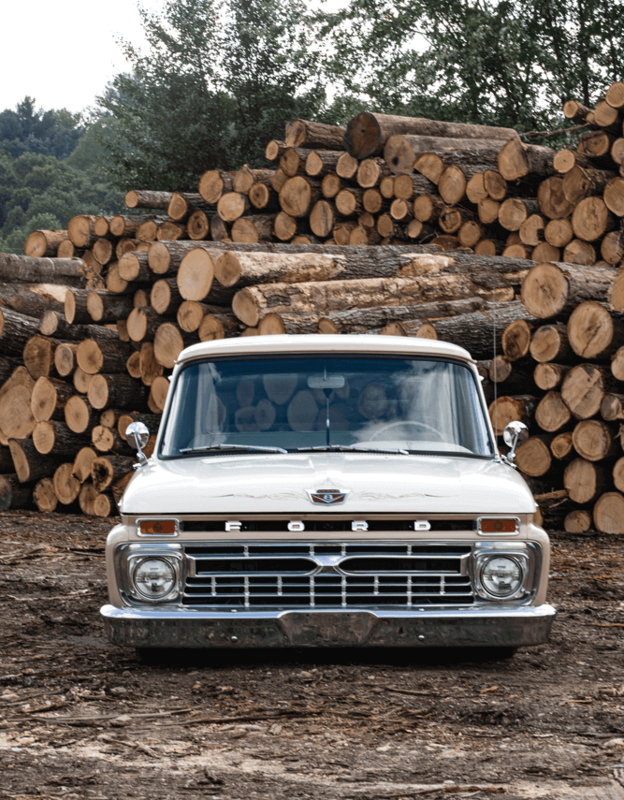 The two platforms are similar: one fourth- and one fifth-generation Ford F-100. Both had been well preserved before being modified. And while both had the common goal of low, loud and handsome, they took very different roads to get there. Five Point Low’s build plan posed some unique challenges. 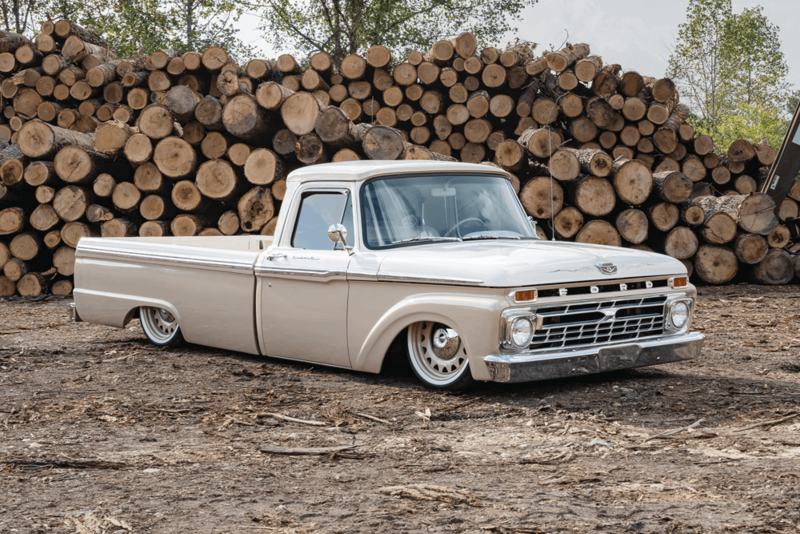 The intended use of the F-100 was two-fold: first, to tow a vintage trailer, and second, to put down a mean burnout. From the onset, the goal was set “as low as possible,” but executing that with practical use in mind would prove a little more difficult. They began with a long-bed model to maximize the usable space within the bed. The frame was notched and modified with a Fatman Fabrications parallel 4-link rear configuration. The front makes use of a Mustang II style setup from Fatman. And the painstaking balance of low and utilitarian paid off in dividends. With the help of Ridetech’s Cool Ride technology at all four corners, Five Point Low now hangs centimeters above the pavement. Indicated in its name, Five Point Low also packs a serious punch. The second goal of the build was for its street presence to be a mean one. Hence, the engine choice was made. With a commitment to keep Ford with Ford in this build, Kirby and his team sourced a Ford 5.0L Coyote V-8 from a 2013 Mustang GT. The modern motor is hooked to a stout 6R80 six-speed automatic transmission. Like its brother in blue, The Imposter, Five Point Low uses Stainless Works headers and exhaust. Along with the Fatman Fabrication’s chassis components, ’89 Speed Shop selected to use upgraded Wilwood disc brakes at each corner. The modernized capabilities of Five Point Low are well complemented by the powerful brakes. Rounding out the stance is a beautiful set of Detroit Steel Wheel Artilleries. The Artillery rollers measure 20×8 inches in the front and 20×9 inches in the rear. 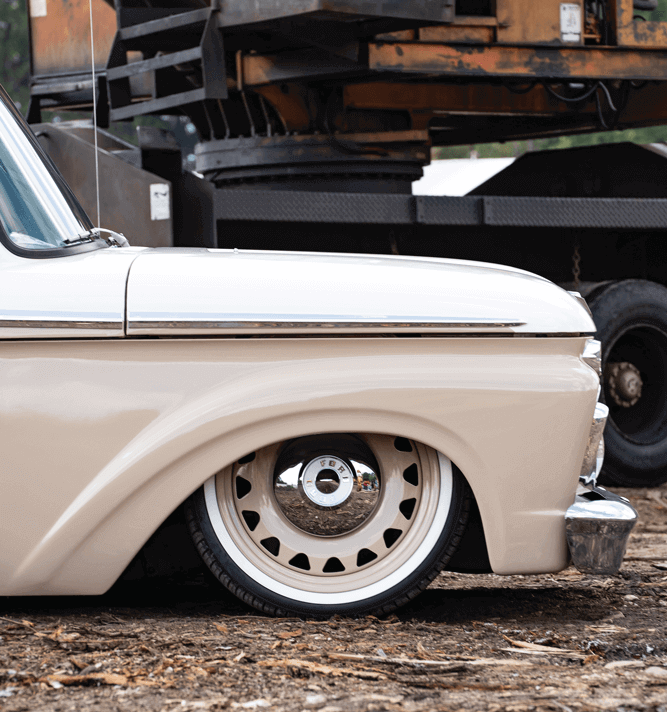 For a classic appeal, they are paired with Diamond Back whitewall tires measuring 245/40/20 and 275/40/20. This extremely clean and timeless interior is a definite home run in Five Point Low. In terms of the exterior, Five Point Low is relatively modest. Nevertheless, the body is completely shined and polished to a brand-new appearance. Its refinished in a factory-style scheme of Wimbledon White and Sahara Beige from PPG. The paint extends through the custom smoothed bed floor and over the small notch cover. The contrast of white and beige extends throughout the build. The Detroit Steel wheels are painted in the PPG beige and contrast with the white wall stripe. The interior continues the juxtaposition with the extension of the beige throughout and the white interior accessories. The factory dash has been smoothed and painted and the factory bench recovered by Ted’s Upholstery. All of the factory controls and instrumentation remain in place but have been restored with paint and polish. 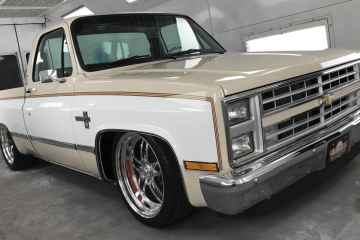 Larry Walker, who just wanted a cool cruiser to pull his vintage camper around the country in style, proves that low and not so slow can definitely be done and done right! 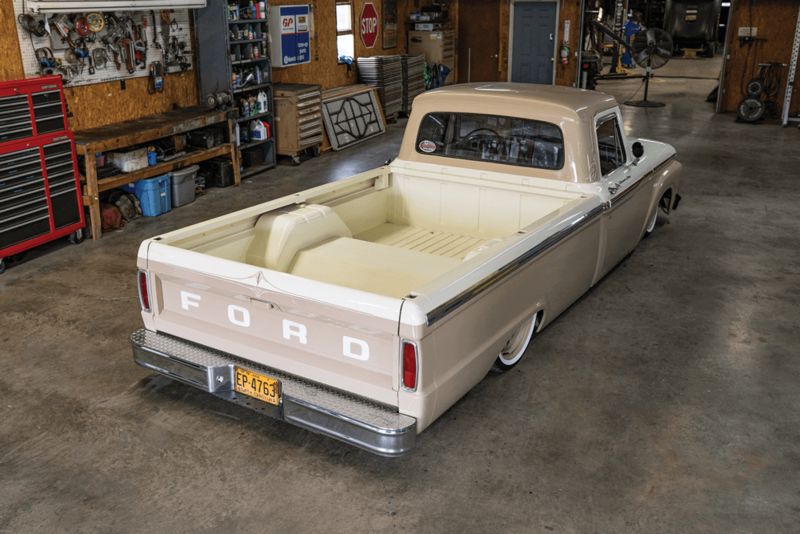 Built for an awesome customer, Larry Walker, who just wanted a cool cruiser to pull his vintage camper around the country in style, this build proves that low and not so slow can definitely be done and done right! The Imposter poses an imposing presence with the help of its dramatic stance. As Kirby’s personal shop build, he wanted it to represent the shop’s full capabilities. Kirby and his crew were able to achieve this with a number of well-thought-out modifications. The original chassis remains in place, but both the front and back sections were rebuilt entirely. The front section is a custom setup based on a Mustang II style. 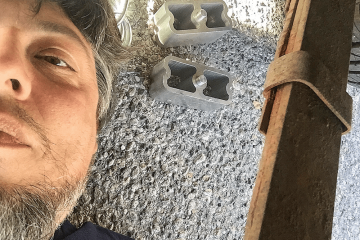 Kirby and his team made tubular control arms as well as custom airbag mounts. The rear section of the frame, having been notched, uses a parallel 4-link configuration and a watt’s link helps to keep it all in line. The rear section uses a custom crossmember to hang the Air Lift Dominator airbags directly over the axle. The middle of the frame also sports a custom crossmember for added rigidity. The middle crossmember sports relief cutouts for the driveshaft and dual exhaust pipes. With the massive reduction in ride height, the Imposter is suspended on Air Lift Performance 2600 airbags in the front as well as KYB shocks. After the extensive fabrication was completed, the entire frame was cleaned and painted gloss black. 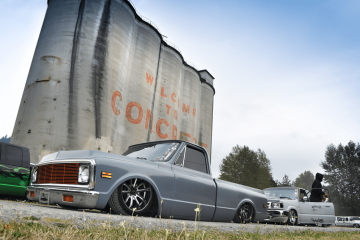 Underneath the Imposter’s hood (and its nicknames inspiration) is a 5.3L Chevy small block. 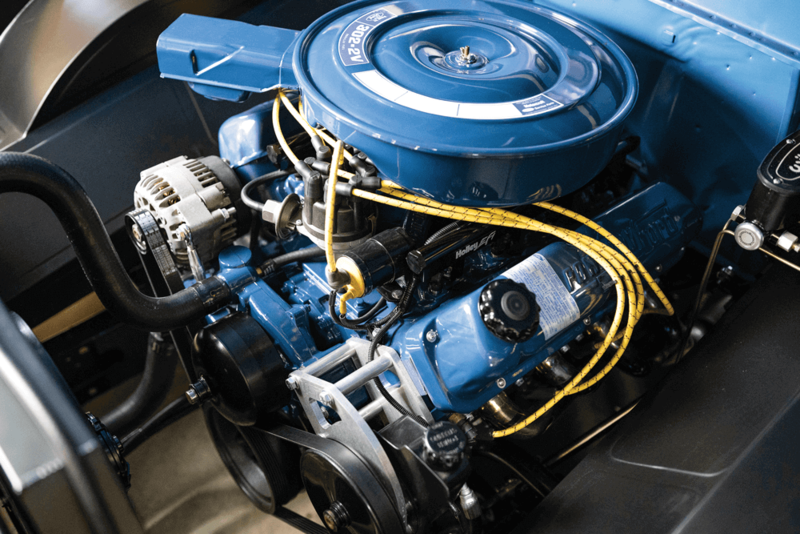 The late-generation derived V-8 provides a trifecta of appeal. It offers power, reliability and availability. The bowtie motor was an easy choice for Kirby. But as he suspected, it has come with its fair share of criticism. The LS-based motor is backed by a 4L60E transmission for convenient cruising. The custom driveshaft runs from the automatic transmission to a Ford 8.8 rearend. The real magic in the Imposter’s use of the Chevy small block is in its presentation. The ’89 Speed Shop crew put together one hell of a disguise. The Imposter receives its name thanks to this cleverly disguised LS, now known as the LS302. Read below for all the details. The LS302 (as they nicknamed it) first sports a custom set of false valve covers. 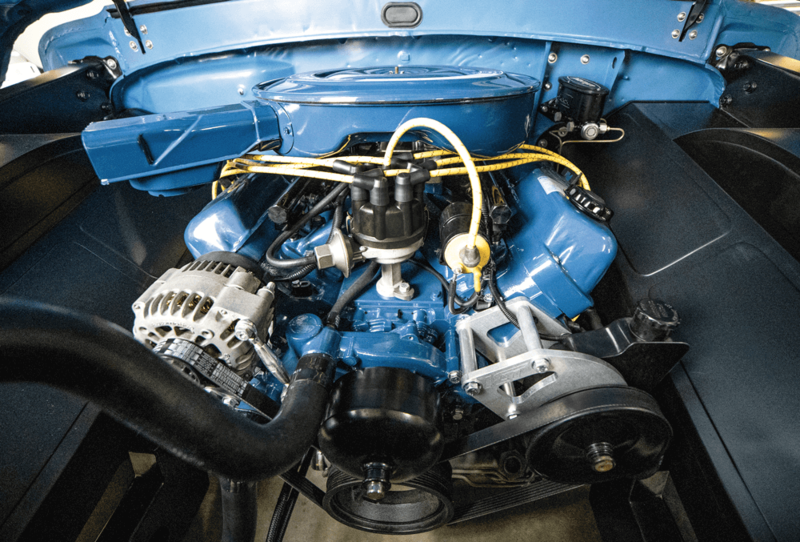 The 302 valve covers proudly display “powered by Ford” in their casting. Furthermore, a custom front runner kit has been built to relocate the power steering and distributor, matching that of a Ford 302. A 302 air cleaner sits atop the Holley intake manifold. The whole motor is finished off in Ford Blue as a final touch. The powerplant does boast a bit by way of its exhaust. It exhales from 3-inch Stainless Works headers, exhaust and dual Magnaflow mufflers. The commitment to the showmanship is both admirable and impressive. The SBC looks perfect at home between the Ford’s frame rails. The Imposter strikes the timeless balance of preservation and modification. Kirby selected a gorgeous set of polished Rev Wheel’s 110 rollers that sit staggered from front to back. The fronts measure 20×9 inches and the rears, 20×10 inches. They are matched with a set of Toyo tires, 255/35/20 and 275/35/20 respectively. Between the polished spokes of the Rev Wheels, crimson brake calibers peak through. Wilwood brake caliper in the front and rear help quell the LS302. The first principle in beginning this build for ’89 Speed Shop was to fully preserve the truck’s identity. 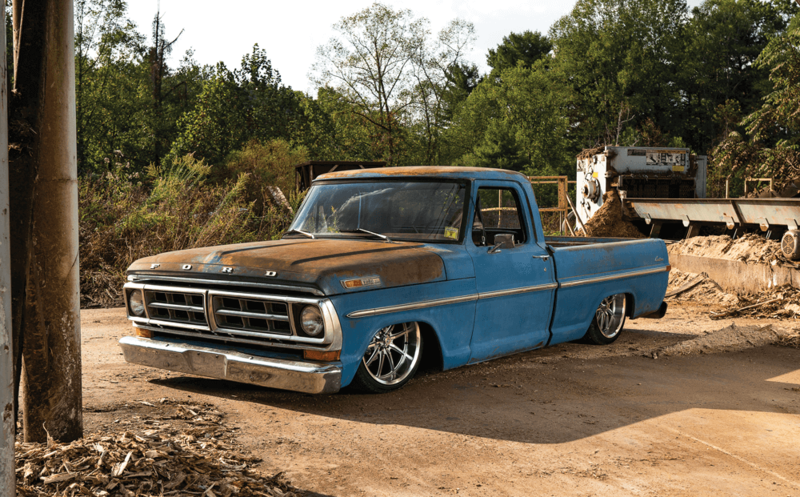 It had spent its entire life in North Carolina as a farm truck. 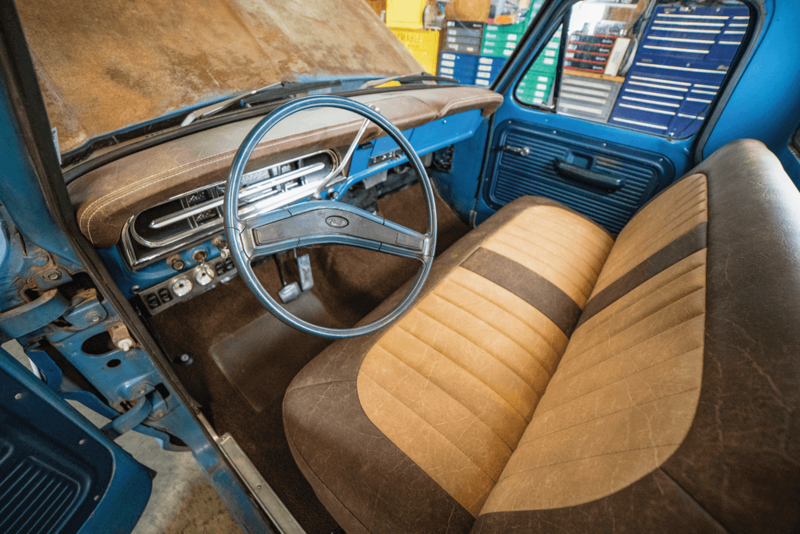 The truck’s original Paint code J3657, better known as Pinto Blue, would eventually evolve into the iconic Grabber Blue of late model Mustangs and other Ford Performance models. Having spent the last 40-plus years aging, the Pinto Blue paint scheme has aged perfectly into its natural patina. The body is otherwise left completely untouched. Its factory polished bits wear their oxidation with pride. The original bed floor has been raised in order to accommodate the custom frame notch. 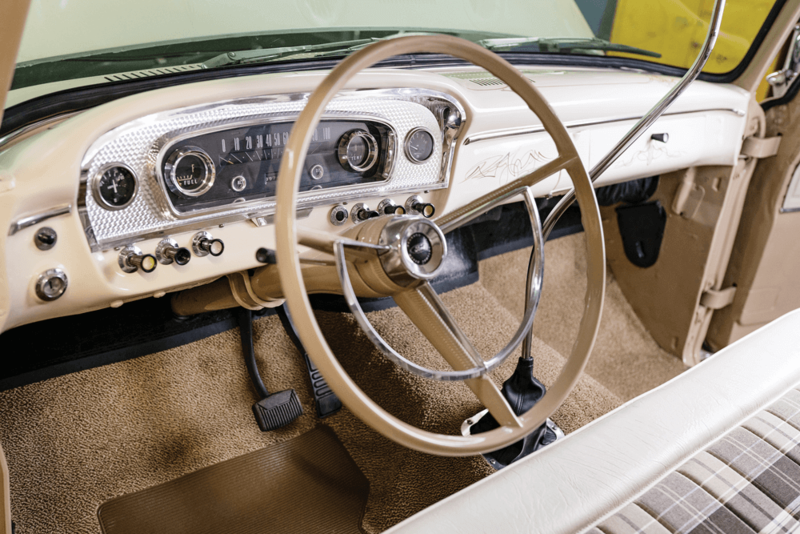 The truck’s interior has likewise been mostly preserved. The touch-points and practical elements have been spruced up for a bit more comfortable driver experience. The dash has been recovered with a replacement component from TMI Interior Products. 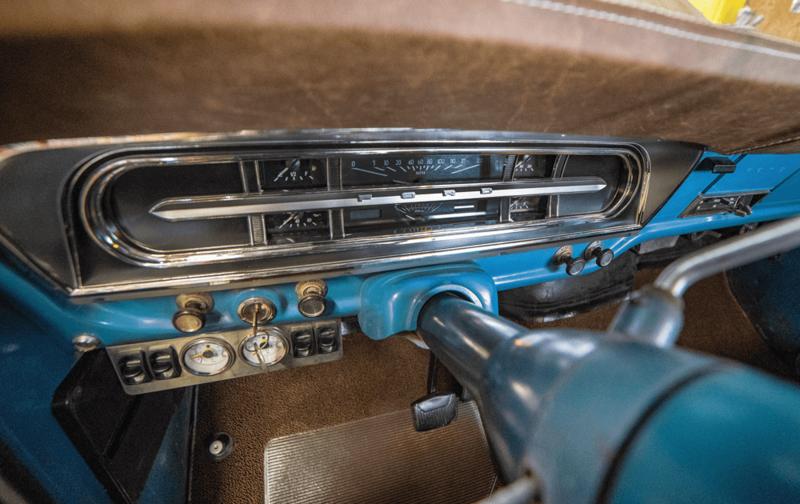 Housed in the refreshed dash are a set of Dakota Digital’s gauges. The modern instruments display the LS302’s diagnostics in a clear but timeless fashion. 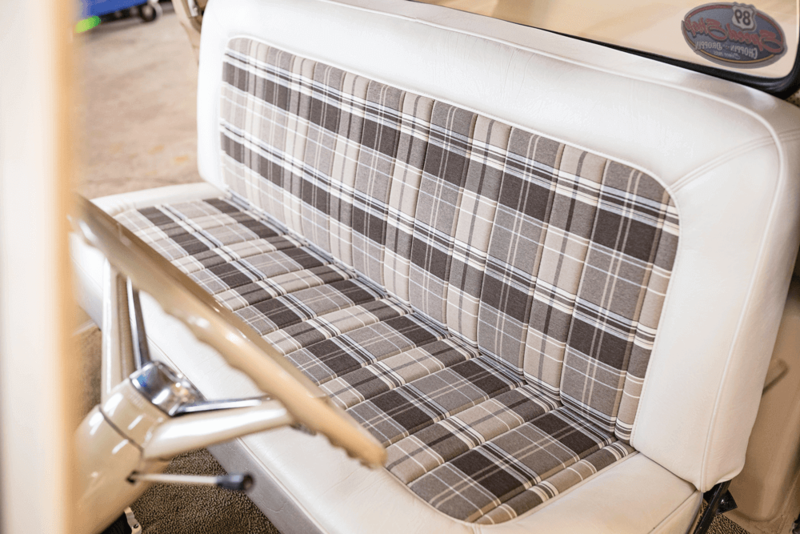 The original bench seat remains in place but has been recovered by Oldson’s Custom Upholstery. Kirby and ’89 Speed Shop represent a massively important part of the industry. They are the young guns of the tradition. But more importantly, they are committed to quality and to diligence. When fresh life is breathed into the foundational elements of building, new life can’t help but develop. The industry continues to change rapidly. Classic trucks have to be shown more and more care. ’89 Speed Shop has proven themselves of more than capable. 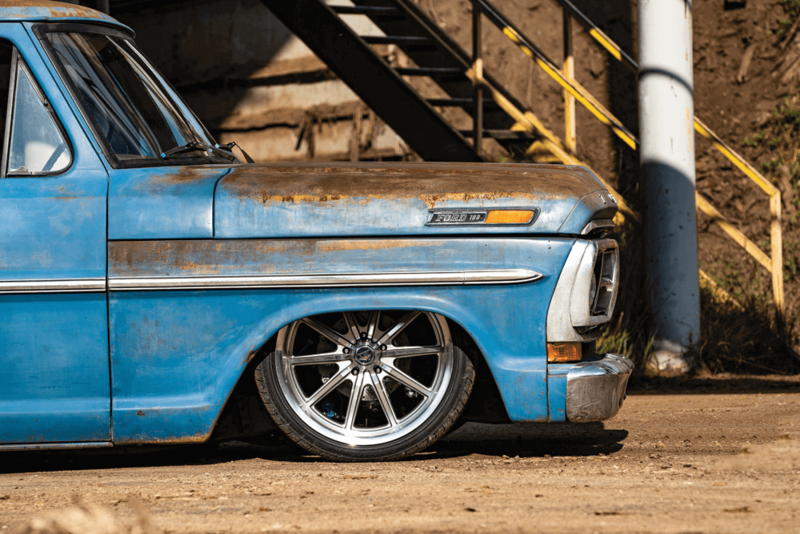 The strides they are making in the F-100 community are simply incredible and the support is overwhelming. 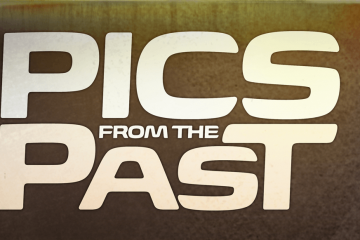 Previous ArticleWORD ON THE STREET IS……. 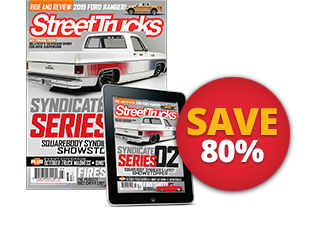 Next ArticleVote for the 2018 Truck of the Year!